While Sophiatown Community Psychological Services does not engage in large scale advocacy, we do in fact advocate all the time: for the right of children to go to school; for the right to documentation; for the right to protection and care; for the right to health services; for the right to social assistance. Most of this happens on a case by case basis, often in collaboration with other partners in the community of practice. 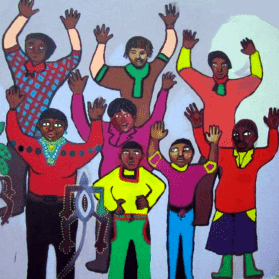 We are founder members of the Johannesburg Child Advocacy Forum and recently have become very active in the Psycho-Social Rights Forum which focuses particularly on the rights of refugees and migrants to mental health services, and to conditions of life which promote healing from trauma and emotional well-being in general. We are also in a network of organizations advocating for the rights of community workers to proper conditions of employment, to a structured career path and ongoing training and support. In the privacy of the counselling relationship we become witness to stories of atrocities and human rights violations many other organizations are not privy too. We know what mechanisms local schools employ to keep poor children out of fee-paying public schools, how mothers are chased away from primary health clinics, and how impossible it is to get legal documentation from the Department of Home Affairs without resorting to bribery. Wherever possible we collect this information and hand our findings to other partners who can use them for larger advocacy campaigns.